Nearly 60% of Americans Believe Effects of Global Warming Have Begun - 24/7 Wall St.
A vast majority of Americans believe that global warming exists. And 59% of them think the effects already have begun. That is about the same as it has been since 2016, according to a new poll from Gallup. 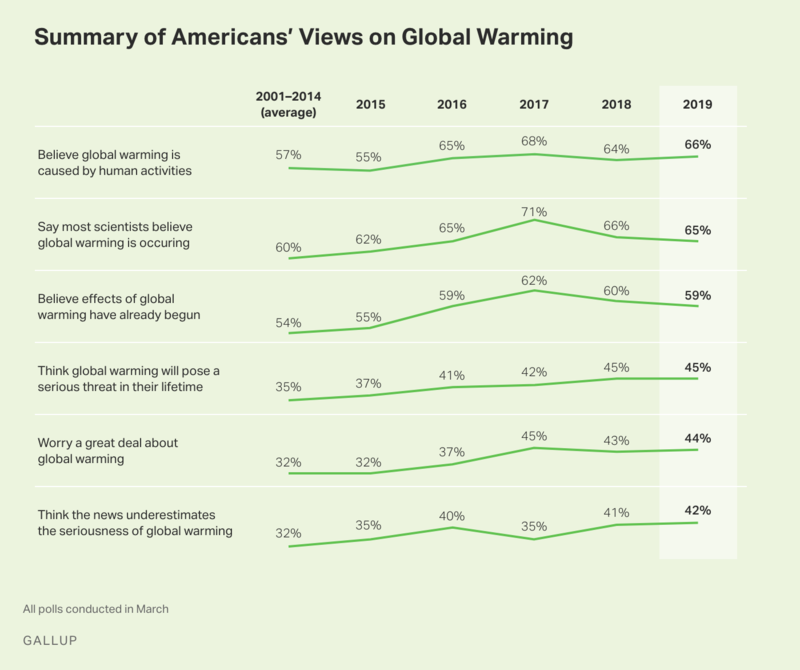 Other results are that 66% of Americans believe that global warming, based on the poll’s results for 2019. Some 65% believe scientists think global warming is already occurring, and 45% believe global warming will be a severe threat during their lifetimes. While some of these results are similar to those posted in Gallup surveys in 2016 and later, all are above figures collected by the research firm from the average of 2001 and 2014, a period during which it asked the same questions. “Concerned Believers” are highly worried about global warming, think it will pose a serious threat in their lifetime, believe it’s the result of human activity, and think news reports about it are accurate or underestimate the problem. “Cool Skeptics” hold the opposing views on the same four questions: They worry little or not at all about global warming, do not think it will pose a serious threat in their lifetime, think it’s attributable to natural environmental changes and think the news exaggerates the problem. Those in the “Mixed Middle” hold a combination of views. Some believe global warming is caused by humans but aren’t worried about it, while others express the reverse perspective — saying warming is a natural phenomenon, but they are highly worried about it. The number of “concerned believers” has risen from 37% in 2015 to 51% this year. Those in the “mixed middle” have fallen from 37% to 30% over the same period. “Cool skeptics” have fallen has dropped from 26% to 20%. Gallup’s other major conclusion is that the level at which people believe in or are concerned about global warming is split sharply by political party. Of Democrats, 77% are “concerned believers,” while only 16% of Republicans are. Gallup reports that the survey was taken between March 1 and March 10.